Drinking as little as one to three cups of tea a day could be beneficial in staving off mental decline, according to new research from the University of California. Experts analysed several studies on the effects of caffeinated drinks on memory and mental alertness. Those who took part logged how often they drank tea or coffee and did a memory test used in the initial stages of diagnosing Alzheimer's disease. Ten years later, all re-sat the test and any fall in score was noted. 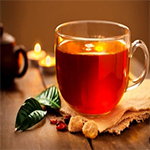 The brain stayed sharper in those who drank tea, the journal Advances in Nutrition reports. It is thought compounds in tea may protect against the poisons that ravage the brain in Alzheimer's. Possibilities include theanine, a plant chemical found only in tea and in mushrooms.